A few months ago Microsoft released the Surface tablet, the companies first attempt in manufacturing and marketing their own product. 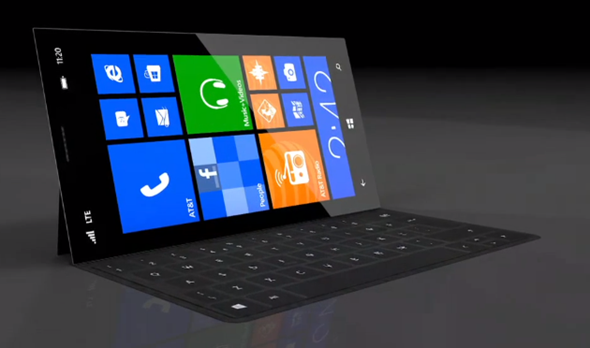 The Surface was a tablet/laptop hybrid, featuring a detachable keyboard and Microsoft’s new Windows 8 RT platform. This prompted much talk around a possible Surface Phone variant, and whilst there have been no official announcements or rumours about such a device, an artist has designed a concept of what the Surface Phone could look like. The device measures in at 5 inches, running at 1280×720 Super AMOLED+ screen, running either Windows Phone 8 or some kind of hybrid of Windows 8 and Windows Phone 8. It has a USB 3.0 port, 12MP Camera, and a bright flash, together with a kickstand like the Surface Tablet which can be very useful for extended periods of typing on the device. The Surface Phone also has a snap-on touch keyboard cover, again similar to the Surface Tablet, but the usefulness of this touch cover may be reduced, given it is only 5 inches wide. Up until now, Microsoft has chosen to license out its Windows Phone 8platform for other manufacturers to create hardware, opposed to choosing to create their own devices. This has always been the case with Microsoft with PC’s and now tablets, but as seen with the Surface, Microsoft now seem to be dabbling in the hardware market, which could indicate it is very likely we will see Microsoft releasing a Surface-inspired Windows Phone 8 device. The Surface Phone looks fantastic, but my only concern is if they do include a touch keyboard cover how they get around the fact a 5inch keyboard will not be very easy to type on at all. Prices are still a mystery given this is only a concept, but no doubt we’ll see something very similar to this being released in 2013.